A Protective Relay is a device that detects the fault and initiates the operation of the circuit breaker to isolate the defective element from the rest of the system. The Protective Relay detect the abnormal conditions in the electrical circuits by constantly measuring the electrical quantities which are different under normal and fault conditions. The electrical quantities which may change under fault conditions are voltage, current, frequency and phase angle. Through the changes in one or more of these quantities, the faults signal their presence, type and location to the protective relay. Having detected the fault, the relay operates to close the trip circuit of the breaker. This results in the opening of the breaker and disconnection of the faulty circuit. A typical relay circuit is shown in Fig. 21.1. This diagram shows one phase of 3-phase system for simplicity. The relay circuit connections can be divided into three parts viz. First part is the primary winding of a current transformer (CT.) which is connected in series with the line to be protected. Second part consists of secondary winding of C.T. and Cu. 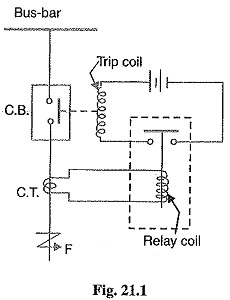 the relay operating coil. Third part is the tripping circuit which may be either a.c. or d.c. It consists of a source of supply, the trip coil of the circuit breaker and the relay stationary contacts. When a short circuit occurs at point F on the transmission line, the current flowing in the line increases to an enormous value. This results in a heavy current flow through the relay coil, causing the relay to operate by closing its contacts. This in turn closes the trip circuit of the breaker, making the circuit breaker open and isolating the faulty section from the rest of the system. In this way, the relay ensures the safety of the circuit equipment from damage and normal working of the healthy portion of the system. 1. Selectivity: It is the ability of the protective system to select correctly that part of the system in trouble and disconnect the faulty part without disturbing the rest of the system. A well designed and efficient relay system should be selective i.e. it should be able to detect the point at which the fault occurs and cause the opening of the circuit breakers closest to the fault with minimum or no damage to the system. This can be illustrated by referring to the single line diagram of a portion of a typical power system shown in Fig, 21.2. It may be seen that circuit breakers are located in the connections to each power system element in order to make it possible to disconnect only the faulty section. Thus, if a fault occurs at bus-bars on the last zone, then only breakers nearest to the fault viz. 10, 11, 12 and 13 should open. In fact, opening of any other breaker to clear the fault will lead to a greater part of the system being disconnected. In order to provide selectivity to the system, it is a usual practice to divide the entire system into several protection zones. When a fault occurs in a given zone, then only the circuit breakers within that zone will be opened. This will isolate only the faulty circuit or apparatus, leaving the healthy circuits intact. It may be seen in Fig. 21.2 that there is certain amount of overlap between the adjacent protection zones. For a failure within the region where two adjacent zones overlap, more breakers will be opened than the minimum necessary to disconnect the faulty section. But if there were no overlap, a failure in the region between zones would not lie in either region and, therefore, no breaker would be opened. For this reason, a certain amount of overlap is provided between the adjacent zones. Electrical apparatus may be damaged if they are made to carry the fault currents for a long time. A failure on the system leads to a great reduction in the system voltage. If the faulty section is not disconnected quickly, then the low voltage created by the fault may shut down consumers motors and the generators on the system may become unstable. The high speed relay system decreases the possibility of development of one type of fault into the other more severe type. 3. Sensitivity: It is the ability of the relay system to operate with low value of actuating quantity. Sensitivity of a relay is a function of the volt-amperes input to the coil of the relay necessary to cause its operation. The smaller the volt-ampere input required to cause relay operation, the more sensitive is the relay. Thus, a 1 VA relay is more sensitive than a 3 VA relay. It is desirable that relay system should be sensitive so that it operates with low values of volt-ampere input. 4. 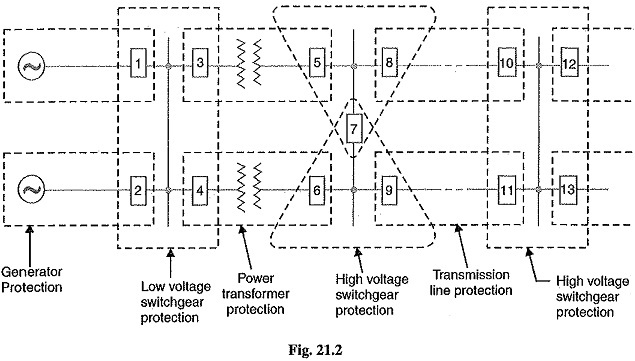 Reliability: It is the ability of the Protective Relay system to operate under the pre-determined conditions. Without reliability, the protection would be rendered largely ineffective and could even become a liability. 5. Simplicity: The relaying system should be simple so that it can be easily maintained. Reli­ability is closely related to simplicity. The simpler the protection scheme, the greater will be its reliability. 6. Economy: The most important factor in the choice of a particular protection scheme is the economic aspect. Sometimes it is economically unjustified to use an ideal scheme of protection and a compromise method has to be adopted. As a rule, the protective gear should not cost more than 5% of total costa However, when the apparatus to be protected is of utmost importance (e.g. generator, main transmission line etc. ), economic considerations are often subordinated to reliability.